And now to answer the back-log of questions and get on track - for the moment any way. I have answered these in no especial order, just as they came out. Before we go on might I let you know that there is a fairly comprehensive interview over at the BookClub - so head on over or read on: it is wall to wall MBT! Either way, let us get cracking. Hmmm, that hoary old chestnut. Mate, Mr. Bomber, you have a knack for the tough questions! I have to frank and say that religion is probably the least developed area of the HC and the lands beyond; it is probably the most complex and perhaps touchy subject. Certainly as you have astutely deduced science or habilistics is a most prevalent point of belief – that man’s knowledge and learning and application of the same will conquer, will fix all ills. This is equivalent of “humanism” I suppose, sometimes referred to as “universalism” or coingnosis (said "CO-in-no-sis") or prosaics (coming from prosagologia – the idea that reason conquers all) Then there are those who seek to raise the false-gods (those anciently man-made abominations) – who might be thought of as worshipers of the same, the fichtärs, cultists eagerly seeking the return of their chosen “lord”. With these there are those are in thrall to the less friendly kind of monster and those who do not hate monsters quite so much and think there might be “good” monsters too – enter those accused as sedorner. Some folk trust to Providence – the idea that there is a God and He will provide – others trust their track to the paths of the Signal Stars – all fairly common stuff. Other ideas not ready for publishing bubble away too, just as they have always done ever since I started notebook 1. The Half-Continent and the world it is in still continues to form and grow – it is no fixed thing and it will take a goodly long time to get my notes into a solid coherent form (of which the Explicariums only tell a part) As for a black and red “football” team, Mr. Madbomber – how about the Bombazines? The Artillerists? The Sappers? Advice is such a tricky thing and my journey has been so long and meandering its hard to know what to say: certainly persistence is essential. I went through a period of about 4 years doing part time work I hated whilst waiting for illustration work to build up, and it was only the Providential intervention of a television show requiring an illustrator that rescued me from more years of toil. Being an illustrator is very rewarding, but until MBT came along (a decade later! – I might add), not very fiscally rewarding. I don’t think the obstacles to a creative life are “put” there deliberately, but it does sort out those who really want to do it from those who "kinda" want to do it. Get your folio – your “book” – looking slick, get a business card or some such of same quality, get an online folio, get yourself about: advertising, publishing, editorial (by which I mean magazines and newspapers), find an agent (though be choosey who you go with – if at all possible, get advice from those who have worked with them), pray if you dare. Be determined but also have some patience: I finished Unit in 1993 and its only been 14 years later that things have reached this stage. I am not sure this helps much, email me if you need more advice. A great request – yet my publishers are sitting on a printed map for now. We’ve argued about releasing a map sooner rather than later, but they want to wait for a bit. Distributing such a map is not as straightforward as I thought it might be. Ah well, on with the online map I say which I hope will be coming sooner rather than later… and thank you John for your enthusiasm for the non-standard setting of the Hc, I am glad to have “hit the nail on the head” for you, as it were. That warms the cockles of me heart, Mr. Missfitt – I have to say the Explicariums are my favourite part of the books too. So chuffed you like ‘em too. As to your questions: hard cover will be coming out first then paperback and I am afraid the Explicarium for Lamplighter may well be shorter – I am told it is a cost thing, that the story of Lamplighter itself being longer impacts on the length of the end matter. 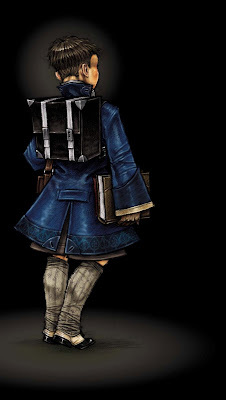 But you never know: with the drastic re-write required of Lamplighter as it stands currently, more room for the Explicarium may only be a few deletions of a chapter away. For me writing a book is not just about the text, it is also the process of illustrating and designing the cover, of the character studies and the density of information at the back, of painstakingly constructing maps from a blank page. Speaking of which I can say that there will be (the Lord and publishers willing) a layout of Winstermill in Book 2. An a nonny mouse viewer asked for a preview of Book 2 – I shall see what can be done. That’s the kind of things publishers get first and last say in I am afraid. Stay tuned …and thanks to another a nonny mouse for the rework of the white stripes number, that's rather snazzy. ... and when you have a chance get along to Inside A Dog for more from me of the blogging kind. As for breakfast today: I am as yet to have it - yes I am foregoing breakfast to get this out, you heard it first here! Keep them challenges coming - it actually helps me make the Hc better. positive exclamations = esteemed and wondrous come to mind, also blithe or blithely though this is more used for good things received from an urchin or nuglung, from the better kind of monster – though don’t tell them I said that else I be carried of to hang as a sedorner. negative exclamations = blighted is probably the most common, often pre-fixed with such things as “twice” or “thrice”, blasted is another or filthy. 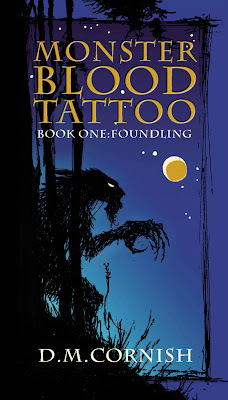 A brief line to gratefully acknowledge Monster-Blood Tattoo: Foundling's inclusion in the ALA Best Books for Young Adults list for 2007! Sincerest delighted thanks to the 'judges' and congratulations to all the other works who were nominated and/or selected. Also I just want to let folks know I am blogging over at Inside A Dog as their Writer in Residence for the month of February, so please, head over there for some more blogging fun. I have to be regular there so (as I said last post) it may just make me more regular here. Editing with MBT 2 is at very very early stages, and the Explicarium for Book 2 is ticking along nicely and will (Lord willing) be done very shortly... and I haven't forgotten those questions still need answering. Well, first things: I have just returned from Brisbane where the 11th Annual Aurealis Awards were held. MBT had the great fortune to be nominated then short-listed in the ‘YA’ category for 2006. Thank you to the judges! So off we went, my wife and I, to Brisneyland (one of the many affectionate appellations we none Brisbane dwellers have for that – as it turns out – wonderful city) I have to confess that I had only passed through once before – a days work at an army barracks a long time ago – and had a southerners prejudice: well I was SOOOOOOO wrong. We loved it there! A salient lesson against mindlessness there. Off we went with a posse of my close ones who have all moved up to Brisy very recently and came out in support of MBT and me. We had a great night. I finally met with the radiant Kim Wilkins, our host for the evening and the author of the Fantastica: Sunken Kingdom series , which I illustrated and was also nominated in the Awards in the ‘Children’s’ section. I talked with Will Elliot – author of The Pilo Family Circus, the winner of both the ‘Horror’ category and the Golden Aurealis! and Juliet Marillier (very briefly as she signed her novel for me) author of the ‘Fantasy’ category winner, Wildwood Dancing – which I am reading and enjoying at this very moment. I also had a chance to chat with Dr Katherine Phelps who herself lectures on such things as world building to aspiring writers – amongst all her many other achievements and activities. I have to confess I was a little dazzled, but there you go – I suppose I can not expect too much in the good social skills department when I spend so much time closeted away making stuff up about a place that is only real inside my own head. Indeed, I am woefully ignorant of many of my fellow “genre” authors and contributors, and to them all I apologise. Equally brilliant was the deep conversations with budding writers, and other newly arrived authors, the brief but deeply encouraging brush with the folks of Small Beer Press – so hello particularly to Kelly and Gavin … and to Melaina too, a fellow word-lover whose passion is contagious. But most brilliant of all was the fact that MBT won the ‘YA’ category. Yep, that’s right – it took the trophy. It is a very strange thing to go from the profoundly personal process of writing, the privacy of editing with publisher (Dyan) and editor (Celia) then find myself squinting into bright stage lights and fumbling out a few awed words of gratitude. It is a strange thing, and as Dr Katherine said on the night, to be short-listed is to be a winner. I am very grateful either way, and pleased and amazed at the recognition to even be short listed. So to Kate and Ron and all those who made the night and everything leading up to it happen – bleeding brilliant and thank you! As for my ever-patient posters, I have not forgotten your questions - oh no! Not at all. I have gathered them over the long hiatus and printed them off and all… and shall get on to them in the next couple of days. Also, you might want to pop along to Inside A Dog for the next month or so, where I am to be the writer in residence and learn how to blog a darn sight more frequently than I do here. Only good things can result ... Lord willing. My word! life is just getting busier… Here was me thinking it would become a little quieter after Book 2 was done. Also: I have just started a dietary change around so be prepared for a thinner DM. sweat = the dribbles, aquicrina or "the quicks" in its vernacular form, or schwess (if you are from Gottland).